FINDING WORK AFTER 40 is available now, and not a moment too soon. The latest report from the Institute for Public Policy Research (IPPR, May 29, 2011) states that nearly half of unemployed over-50s have been out of work for more than a year. When we developed the plan for our book two years ago, that figure was one third. So while the ONS numbers for overall employment have improved somewhat, the rate of long-term unemployment has increased for the over-50s, and it’s the highest of any age group. The figures clearly indicate that older workers have been sidelined. And they’re not getting much help. The job club network in Berkshire (Foundation for Jobseekers) has determined that 60 percent of older managers and professionals do not receive any kind of outplacement support. There’s very little on offer from the government. Jobcentre Plus is no solution. So you’re on your own. Or are you? We don’t promise to solve your dilemma, but we can help. Our book is packed with information distilled from the Berkshire job club network, which has assisted over a thousand people to become economically active. 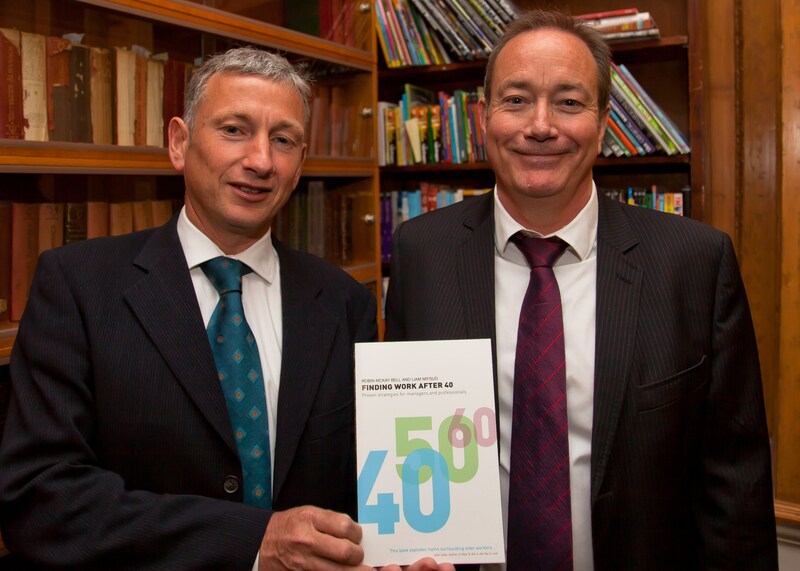 The authors – Liam Mifsud and I – have seen many jobseekers and career changers succeed using the methods we describe. If you’re stuck in a rut, or spinning your wheels and getting no traction, try working through our book. Admission is £3, but wine is on offer and the money is deducted from the purchase price of the book. This one is Liam’s ‘local launch’, and we’re doing it to raise awareness for the Windsor & Maidenhead Executive Job Club. Both authors will be there. Open to all, with free admission. This one is Robin’s ‘local launch’. Wine is involved. Liam won’t be in attendance. Admission is free. To book a place email: bip@westminster.gov.uk, or telephone 020 7641 5250. We’re told these events are very popular, so you should reserve to guarantee a seat. Coffee and tea will be available. Sorry there’s no wine. You may be wondering what we look like. Here’s a photo to help with easy identification on the night. It was taken the at Bloomsbury publisher launch at Soho Square. Liam’s on the left, I’m on the right.